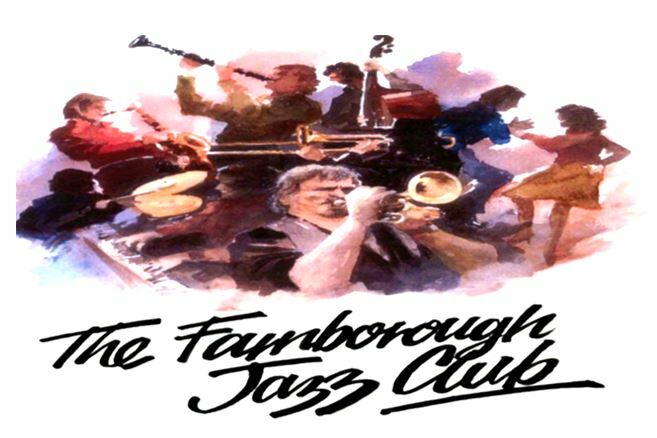 JUBILEE JAZZ BAND played for us on Friday, 25th October 2013 here at FARNBOROUGH JAZZ CLUB. The guys in the band were KEN REESE (trumpet), BARRY PALSER (trombone), JOHN LEE (reeds), HUGH CROZIER (piano), GERRY INGRAMS (double bass) and DOUG HIGGINS (drums). Many of our audience were missing, having gone away to a jazz weekend. Fortunately, a few ‘not so regulars’ turned up. Keith and I have often thought one day, you will all turn up together and we will have to turn some of you away – only joking! The wonderful thing was we had a guest artist. None-other than the lovely jazz singer, MARY WILKINSON. We have known Mary for best part of twenty five years (her husband, Mick has played in a couple of bands with Keith, including Keith’s own band ‘The KGB’). All the band were playing well and the first number I jotted down was Barry singing ‘I Can’t Believe that You’re In Love With Me’. Next was a great ‘Bix’ Beiderbecke number called ‘From Monday On’, sung by Hugh. Barry told us the next two numbers were known for different names. ‘Apex Blues’ (a jaunty little number) was also known as ‘Wibbly Wobbly Blues’ and a number I just love, ‘Fidgety Feet’, was originally called ‘War Cloud’. Don’t you just love Barry’s little extra bits of information? Hugh had a feature on piano with a beautiful tune from the film ‘The Great Zeigfeld’ called ‘You’, he is a brilliant pianist. Then Hugh sang a marvellous duet with Mary, with a Bessie Smith number called ‘Oh! Daddy Blues’. Mary then sang with the band to the next number, ‘It’s A Sin To Tell A Lie’, (a song originally by Fats Waller, also of Billie Holiday). Mary does sing a lot of Bessie Smith songs, so we all think of her voice being Bessie’s type, but Mary has her own unique voice and can sing any song beautifully (especially her cheeky songs too). I filmed the next three numbers. One, sung by Barry, was another ‘Bix’ number called ‘Louisiana’. Mary sang a couple of great blues number called ‘Organ Grinder Blues’ (original singer Eva Taylor) and ‘Down Hearted Blues’. It was great to have captured Mary’s singing on film, but I was disappointed you couldn’t see her too clearly, being too dark. I have been too busy (as usual), but with a bit of luck, I will be purchasing ‘the real McCoy’ video camera, so hopefully will be able to put some good videos on this website. Meanwhile, I can’t even send my films by email to the bands to check if they like them enough to allow them to be published here! It seems they are too big to send! Technology! Who’d have it? Seriously, I will get it right soon, but here it comes, my usual remark- hmmm! Well at least with technology, you can look up numbers on the internet, listen to them and remind yourselves. I don’t know about you, but I cannot remember names of songs (jazz, or otherwise) until they start playing. No! I’m not getting old! This entry was posted in Jubilee Jazz Band, Uncategorized on October 30, 2013 by Diane.